The city of Bruges has acquired the manuscript 'La Pénitance d'Adam' of Colard Mansion for the collection. 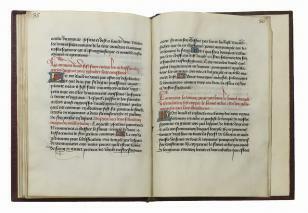 The manuscript was on view in the spring exhibition 'Haute Lecture by Colard Mansion' at the Groeningemuseum. The work was bought at 'Les Enliminures' in Chicago. Colard Mansion is one of the most important and mysterious figures in history of Flemish book production. Mansion's oeuvre was firmly rooted in the existing craftsmanship of the book-making industry for which medieval Bruges was famed, a cosmopolitan industry with a strong international anchoring. Moreover, it was an industry employing many pairs of highly-skilled hands, attracting artists and other professionals from a wide region of Northern Europe. Their number and their influence led to the creation of a new specialist guild, the librarians' guild. Mansion was closely involved with these developments, being an excellent writer (copyist) and learned translator, as well as a book entrepreneur in the widest sense of the word, undertaking major projects for the creation of large and luxuriously illuminated manuscripts. Last but not least, he was a book printer of high repute, capitalizing on the new form of book production that was quickly conquering Europe after the revolutionary innovations introduced by Johannes Gutenberg in Mainz in 1455. 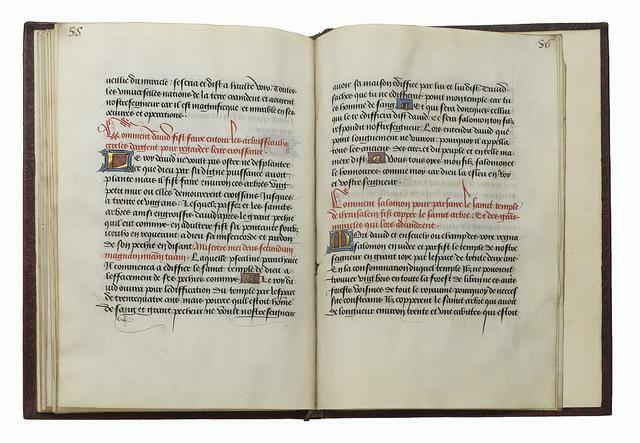 The copy of 'La Pénitance d'Adam' was made for Louis de Gruuthuse (c. 1425-1492), the greatest bibliophile and art-patron of the Burgundian Netherlands outside of the ducal family. La penitence d'Adam is a translation into French of the Latin apocrypha, the 'Vita Adae et Evae' and tells the apocryphal story of Adam and Eve after their expulsion from Eden. The new acquirement will be presented in the renewed Gruuthuusemuseum. By spring 2019, you will once again be able to admire this luxurious city palace of the lords of Gruuthuse in all its magnificent glory.